I have to admit I wanted to shout it to the rooftops the other day when I found out about Jon Speelman's coverage of my game against Colin Crouch (My head's subsequently reduced a little in size, although give it a while longer before normality returns). After all, Jon's one of England's greatest players, he qualifed twice for the Candidates matches, and as I posted previously on Chess Tales, he was once ranked number 4 in the world. Despite this, I also have to admit to a shocking lack of knowledge of his games and results. One game that I do remember well though was in his Candidates 1/4 final match with Jan Timman in 1989. If my memory serves me right, it was the final game and Jon needed a win with the Black pieces to force the match into a play-off. His choice of opening for the game was the Schliemann Defence (1 e4 e5; 2 Nf3 Nc6; 3 Bb5 f5!? 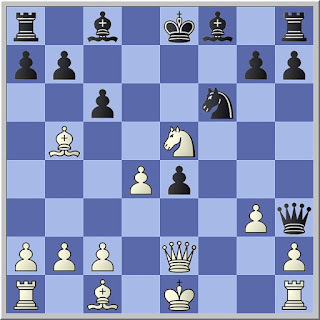 ), one of the wildest lines Black can adopt against the Ruy Lopez. Originating in the 1840's, and truly at home with the romantic gambit play of the 19th Century, it's certainly not something you'd have expected to see in a modern Candidates Match. Play went down one of the main lines, where White hopes to prove that Black's queen is offside and to gradually pick off the weak Black pawns. As compensation Black has active play for his pieces, and as happened in the game, the Queen can actually prove to be well posted to support an attack. I was so impressed with the game line, that I twice foresook my Sicilian and adopted it as a surprise weapon. The results were good: a win and a draw against strong opposition.